Knit Up & Dye Podcast, Yarn & Knitting Patterns: Giveaway! To celebrate my Robin Hunter interview I'm hosting a giveaway! To enter giveaway, leave comment below and follow my blog. Be sure to leave me a way to contact you! - Purchase from Lindy Howell & Friends Etsy shop and earn you an additional 5 entries to this giveaway! To get credit for your additional entries, please be sure to let me know what you’ve done by leaving separate comments for each entry that you've completed. You must list your blog address if you post a link. Be sure to include your email address, substituting "at" for @. This giveaway will end at 11:59 PM MST, Friday, December 2nd. Two winners will be chosen using a random number generator on Saturday, December 3rd. I look forward to reading each of your comments! I am big into making hats and just love your baby gnome hat. SOmeday I will get nervy and selfish enough to knit a hat for myself- maybe Twisted Winds. I favorited the baby gnome hat. What a lovely giveaway - the ornaments are adorable! I am RowdyGirl on Rav. Cute stuff!!! Love the scarf pattern on Ravelry!!! 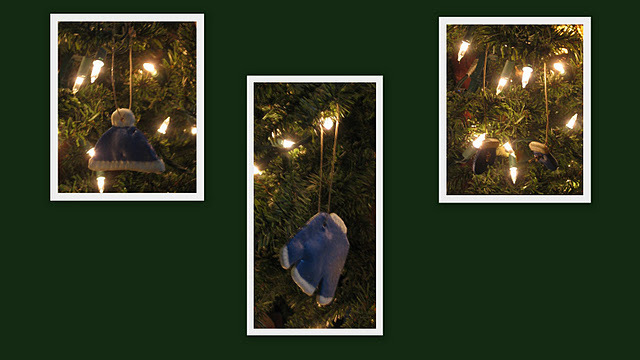 Such cute ornaments ~ I love the shade of blue!